Welcome to the North Cascades National Park Information Page. North Cascades National Park is located in northwest Washington approximately 85 miles east of Bellingham, WA. The North Cascades National Park Service Complex is in the middle of millions of acres of public lands, including much Congressionally-designated wilderness. The Pacific Crest Trail, stretching from Mexico to Canada, passes through the area. The closest major airport is Seattle, and there is a smaller airport in Bellingham, Washington. 1. Take I-5 South to Stateroad 20 East to the park. 2. Take Highway 97 South to Stateroad 20 West to the park. 1. Take Stateroad 20 West to the park. 1. Take I-5 North to Stateroad 20 East to the park. 2. Take I-82 North to I-90 West to I-5 North to Stateroad 20 West to the park. 3. Take I-82 North to I-90 East to Stateroad 281 North to Stateroad 28 / Highway 2 / 97 North to Stateroad 153 North to Stateroad 20 West to the park. 1. Head to I-5 North or South and follow the directions above for North or South to the park. North Cascades National Park came into being, officially, on 02 Oct 1968, when Lyndon B. Johnson signed the North Cascades Act. This act created the North Cascades National Park Service Complex which comprised of 684,000 acres of wild land. It also included the park’s north and south units, as well as Ross Lake and Lake Chelan national recreation areas. This same act created the adjacent Pasayten Wilderness of 550,000 acres and enlarged the Glacier Peak Wilderness to 464,000 acres. In 1988 Congress designated approximately 93 percent of the three areas as the Stephen Mather Wilderness to provide additional legislated protection. The Cascades were among the world’s greatest mountain ranges. Extending from Canada’s Fraser River south beyond Oregon, they contribute greatly to shaping the Pacific Northwest’s climate and vegetation. The highest visitation is in August, with the lowest in January. These area average just under 400,000 visitors per year. Fur traders, traveling on foot and by canoe, were among the first Euro-Americans to venture into the North Cascades wilderness in the late 1700s. Many of the early settlers trapped to supplement their income. Trapping was primarily a winter activity, the most difficult season to be afield in the mountains. The Weaver brothers came to Stehekin primarily to trap animals for a living. They were so successful that they opened a taxidermy business across the river at what is now called Weaver Point. John McMillan, a miner, ran traplines along Big Beaver Creek and the upper Skagit River in the late nineteenth century. Beaver, bear, cougar, wolf, lynx, fisher, marten and fox were all sought by trappers in the North Cascades. The earliest recorded crossing of the North Cascades by a Euro-American occurred in 1814. Alexander Ross, a fur trader, crossed Twisp Pass and descended Bridge Creek to the Stehekin River, which he then followed upstream. Finally crossing Cascade Pass, he traced the Cascade River downstream to its confluence with the Skagit River. Maps of Washington Territory in 1860 show large areas still labeled “unexplored.” The handful of explorers who followed Ross, also commented on the region’s rugged, isolated nature. Native people have lived along the Skagit River for many centuries. Many different bands have traditionally occupied the Skagit valley. Today these bands are represented by the Upper Skagits, the Sauk and Suiattle tribes, and the Swinomish. Archeologists have found evidence that the Upper Skagit band lived in the area now called Ross Lake National Recreation Area at least 8,000 years ago. The mountain world of the North Cascades is a rich and varied ecosystem – a place bound together by geography and climate and by the interactions of living communities of plants and animals. It is the dramatic variations that we notice first: the sharp contrast between old-growth forests of the river valleys and dwarfed and twisted krummholz trees of a subalpine ridge; the difference between the lush greenery of the west side and drier forests of the eastern slope. Not all the differences between habitats are dramatic, however. Subtle changes may be noticed as one habitat and community grade almost imperceptibly into another. The North Cascades Visitor Center, Sedro-Woolley information station, and Wilderness Information Office are fully accessible. The approach to the Golden West Visitor Center is an unpaved, sloping path which can be negotiated with assistance. There is a ramp into the center itself. At Stehekin, a shuttle van equipped with a wheelchair lift is available for transportation up valley to High Bridge. The Sterling Munro Trail at the North Cascades Visitor Center and the Happy Creek Forest Walk at milepost 135 on the North Cascades Highway are fully accessible boardwalk paths. The former leads 300 feet (99 meters) to a spectacular view across the forest canopy to the rugged Picket Range. The latter is a 1/3 mile (1/2 kilometer) loop through ancient forest. The River Loop Trail and the Newhalem Creek Rockshelter Trail, both in the vicinity of the North Cascades Visitor Center, are accessible trails with good surface and less than 8% grade throughout. The Rockshelter Trail ends in a boardwalk providing a view and interpretation of an archeological site. Call the National Park office for additional accessibility information, particularly concerning getting to and around Stehekin. Take a drive on Stateroad 20, the North Cascades Scenic Highway, through Ross Lake National Recreation Area with stops at the North Cascades Visitor Center, Diablo Lake Overlook, and other scenic pullouts. A short walk on the Happy Creek Forest Walk (milepost 135 along Stateroad 20) will give you a sense of the old growth forest in the North Cascades. 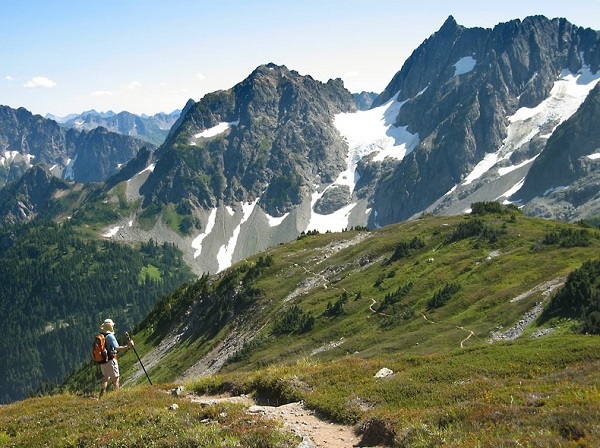 There are several short hikes to take in the vicinity of the North Cascades Visitor Center. Then travel to Stehekin via trail or boat or float plane from Chelan and stay several days. Stop at the Golden West Visitor Center for advice on walks and hikes in the Stehekin area and for backcountry permits. Mountain and trail bikes, as well as other motorized and mechanized equipment, are prohibited on all trails in the Park Complex. They are permitted on paved and unpaved roads not closed to entry. Many public campgrounds in the North Cascades are accessible by road. Most sites are filled on a first-come first-served basis. Free campgrounds are primitive, requiring that you bring your own water and pack out garbage. Food & Supplies are available in Concrete, Marblemount, Newhalem (limited), Chelan and Stehekin (limited) areas. The park maintains 386 miles (618 kilometers) of trails throughout the North Cascades Complex. The trails vary in degree of difficulty and access. Dogs, cats, and other pets, are not permitted on the trails or in the cross-country areas, within the National Park (except the Pacific Crest trail, where leashed dogs are permitted). Generally, the best weather for visiting the North Cascades occurs between mid-June and late-September. Snow is usually off all but the highest trails by July. Summer storms are common in this period: always be prepared for a few days of rain and wind. If you are going into high and remote areas, take good, light rain gear and a tent. Warm, waterproof clothing and a tent are virtually mandatory for spring, fall and winter trips into the backcountry. Heavy snow and rain, depending on elevation, characterize the North Cascades from fall into spring.